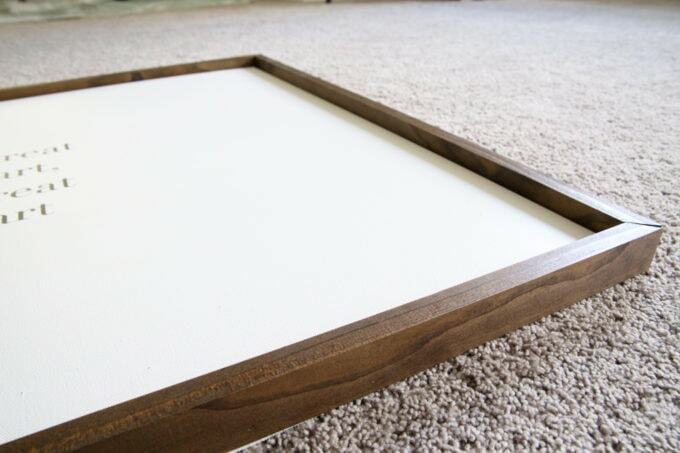 Learn how to make large DIY framed canvas art to fill a big open wall in your home! 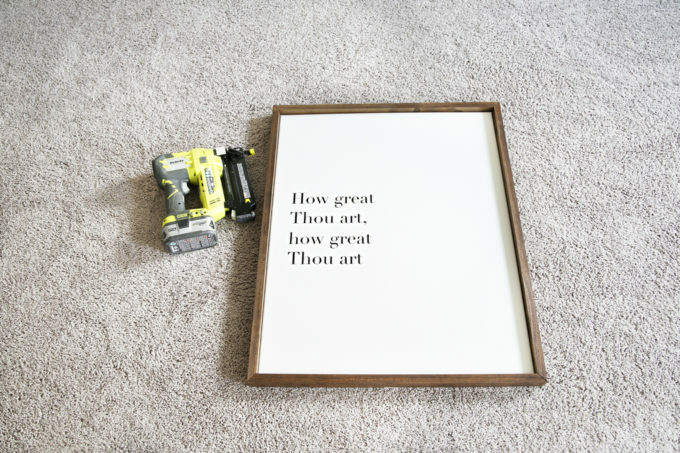 If there’s one area where I struggle when it comes to decorating our home, it has to be wall art. I want to be intentional about the things that fill our walls. I want them to have meaning and substance. And of course I want them to look pretty. My struggle with filling our walls has been even more magnified since we moved into our new house because not only do we have more wall space to fill, but we also went from 7.5′ ceilings in the townhouse to 9′ ceilings in the new house, making almost all of the wall decor I already owned look really, really tiny. I was especially having trouble with the wall space between the two windows in the living room that face the back of our house. I have tried several different pieces there over the 12 months we have now been in our house, and I haven’t really liked any of them. Clearly everything was way too small! 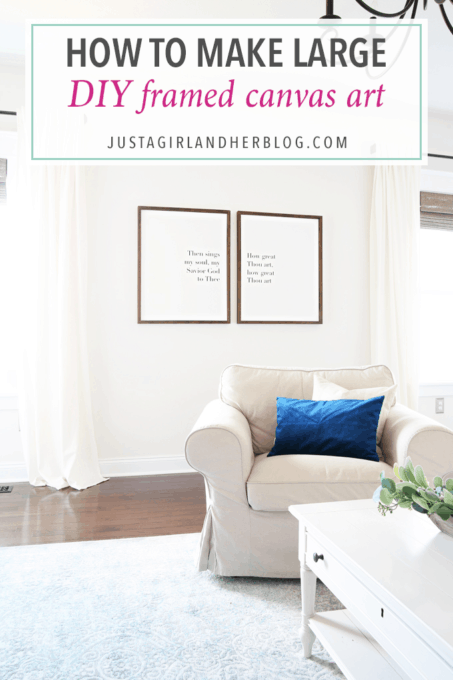 By the time summer rolled around, I had replaced my original attempt with something a little larger (though still not large enough), but I found myself trying not to show this wall in my home tours because I just didn’t love how it looked at all. When I was getting ready for my fall home tour, then, I was determined that I would finally find the right pieces for this space. I didn’t find anything at the store that was a perfect fit, but I had the idea to make something myself that I would love and want to keep around for a while. The first thing I did when I started this project was recruit Donnie to help me cut the framing pieces. I did this first because I knew I wanted to stain them, so I needed to give them plenty of time to dry. 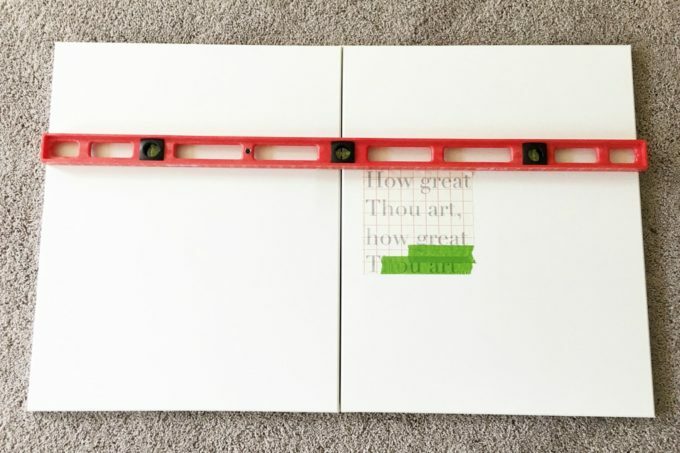 He used his miter saw to make 45 degree angled cuts at the length of each side of my canvases, leaving me with two shorter pieces and two longer pieces per canvas. I took my cut down 1x2s out to the garage and used a rag + Minwax Dark Walnut stain to stain my pieces. I ended up doing 2 coats to get the color I wanted. While my stain was drying, I laid out my canvases on foam boards and gave them a quick coat of paint. (You could skip this step if you want to, but I like to do it because I think it gives the canvases just a little bit more “texture” to them.) 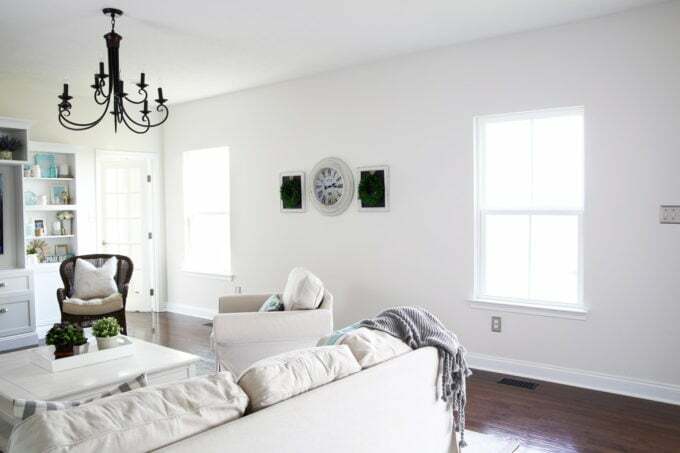 I used Behr Arcade White, which is just ever so slightly off white, and I really liked how it turned out. As everything was drying, I headed over to my computer to create my design in the Silhouette Studio software. 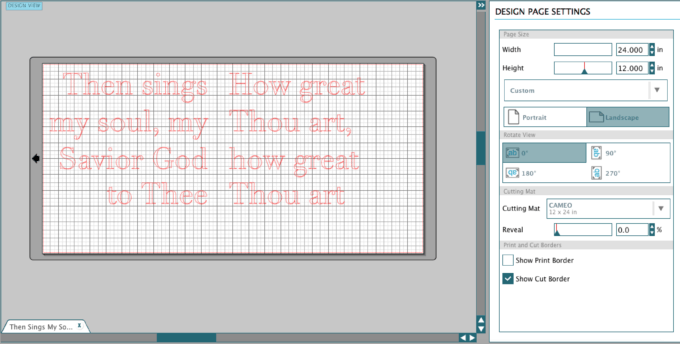 I chose to use the lyrics to one of my favorite hymns, How Great Thou Art, for my design, but you can, of course, use whatever you want! I set my design page settings at 12″ x 24″ so that I could lay out my words next to each other to see how they would look. For reference, I used a font called Didot in 133 pt size. 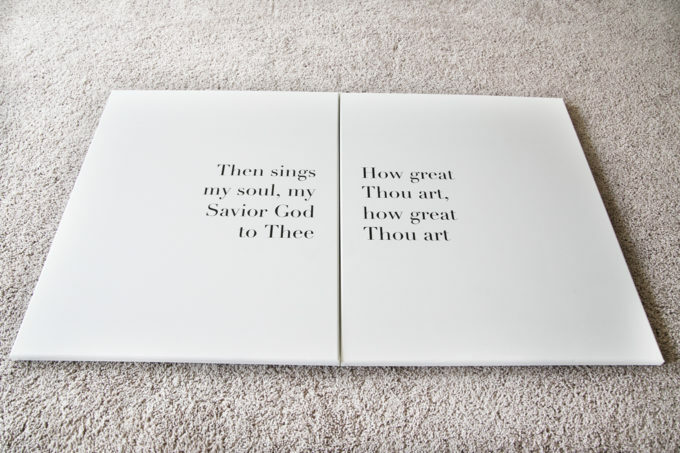 I was also sure to right align the words for my first canvas and left align the words for my second canvas so that they would line up neatly together. And I always just use their recommended cut settings for vinyl, which is blade at 1, speed at 5, and thickness at 10. Once my design was cut, I weeded away the excess vinyl. By this time the paint on my canvas was dry. Because canvas can be a tougher surface for vinyl to adhere to, I always give the area where my words will be a light coating of spray adhesive. I let it dry for about 5-10 minutes after the initial spray so that it is a little bit tacky when I go to transfer over my words. While I was letting the spray adhesive dry, I cut a piece of transfer paper to the size I needed it and lined up my design for one of the canvases with the grid marks on the transfer paper. I then used my scraper tool to make sure the vinyl was firmly adhered to the transfer paper. As you can see, I was running a little short on transfer paper when I was doing this project, so I just used a few pieces of Frog Tape to cover the last little bit, and it worked just fine. 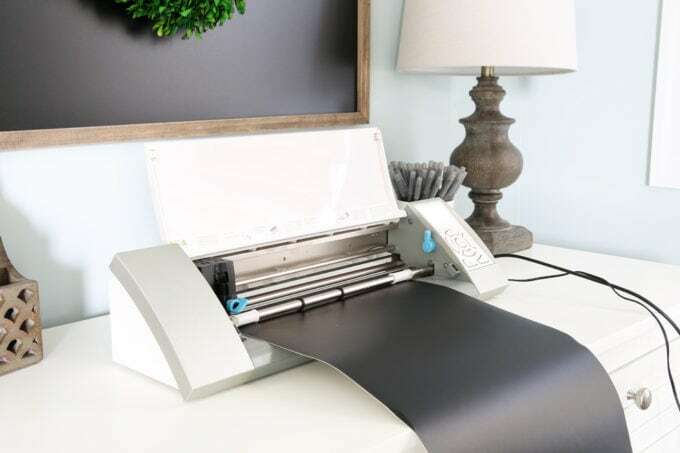 Silhouette brand transfer paper is always my first choice for transferring, though, because I’ve found it’s the easiest to work with of all the different transfer methods I’ve tried. 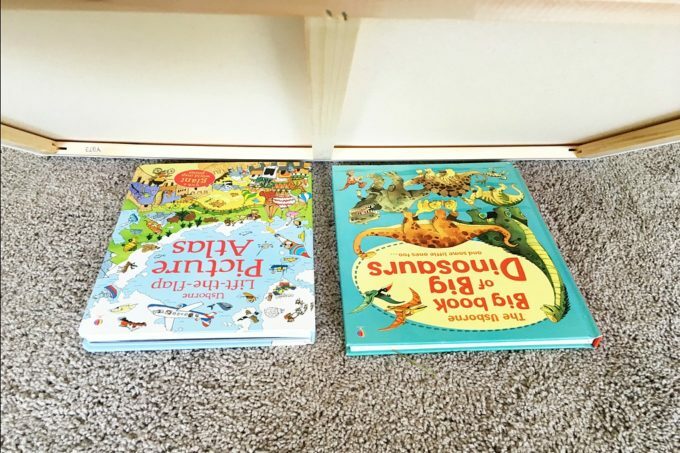 Before I put my words on the canvas, I put some books down under them so I would have a harder surface to transfer my vinyl letters onto. Once I was confident in the placement of my words on the canvas, I again used my scraper tool to try to make sure my vinyl letters were adhered to the canvas as firmly as possible. Even with all of my scraping, I was very, very careful as I peeled back my transfer paper because the vinyl will still want to stick to the paper sometimes rather than the canvas. I typically peel my transfer paper away starting in the upper left corner and peeling back diagonally toward the bottom right corner. 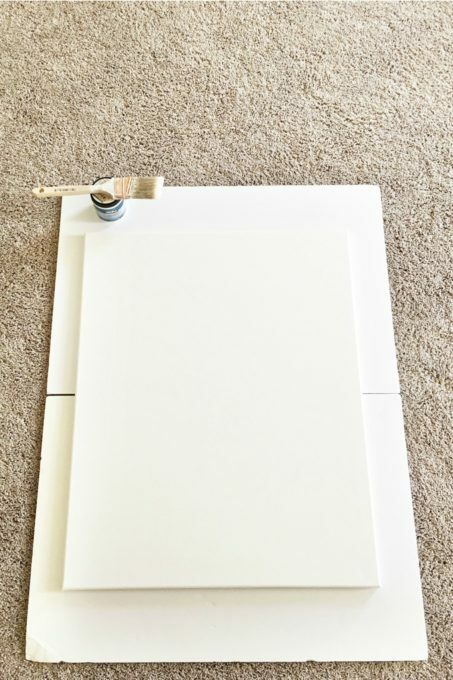 If my words try to come up with the transfer paper, I sometimes need to use my scraper tool or my nails to hold the letter in place on the canvas as I peel away the transfer paper. It can be a tedious process sometimes, but using the spray adhesive that I mentioned before helps to make it a little easier. 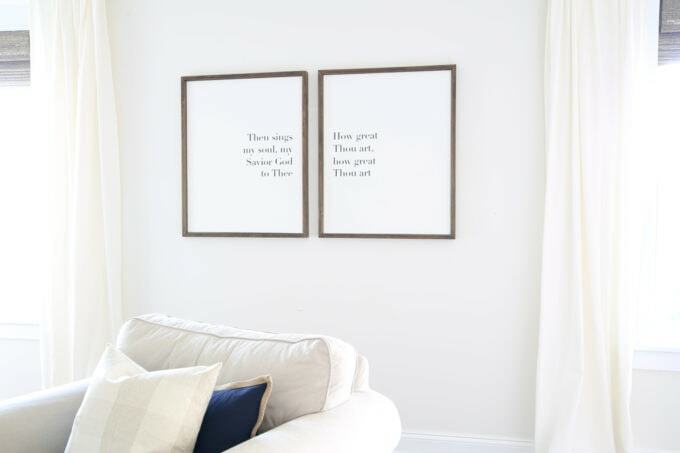 Once I had one set of words in place, I repeated the same process with the words on the other canvas, making sure the words on the two canvases lined up with one another exactly. I actually let my stained frame pieces dry for a few days before I attached them to my canvas because I didn’t want them to smudge up my beautiful artwork if they weren’t dry! 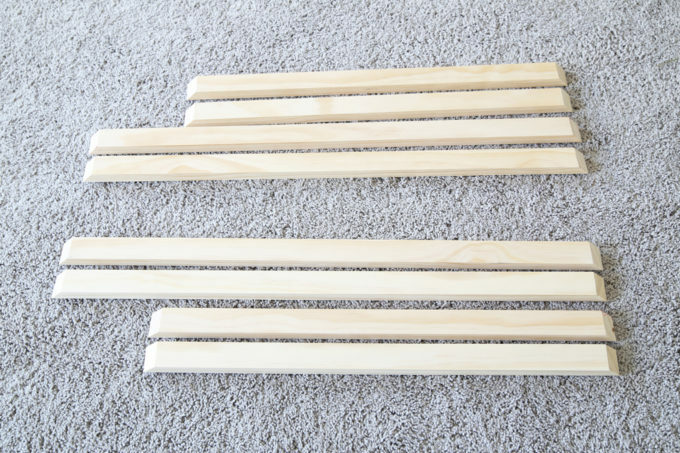 When I was 100% confident that they were dry, Donnie used his nail gun to adhere each piece to the frame, putting a small bit of wood glue on each corner where the 1x2s met to make sure they would stay together. Be sure to double check that your frame pieces line up perfectly around the canvas. Donnie had to cut a few of our pieces down a tiny bit with the miter saw right before we attached them to make sure there wouldn’t be a big gap between the frame and the canvas. We opted to put the back of our frame flush with the back of the 1×2, so there was a little big of overhang with the wood in the front of the canvas. We really liked the look it created. Step 8- Hang Your Masterpieces! All that was left to do was hang up our art and fill up that great big wall that has been bugging me for over a year now! 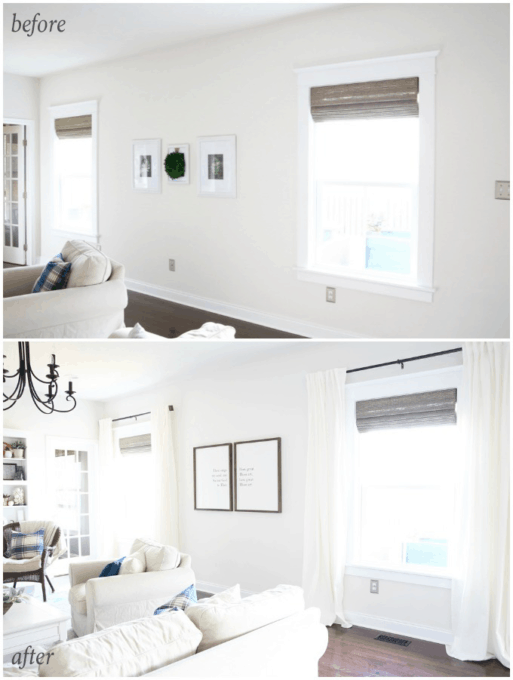 We ended up hanging some flowy white curtains around the windows too, and the combination has me swooning!! I love it so much more, and I really don’t even think the picture does it justice. They feel like a statement piece when you walk in the room, and I’m thrilled to finally have something in this spot that I love! 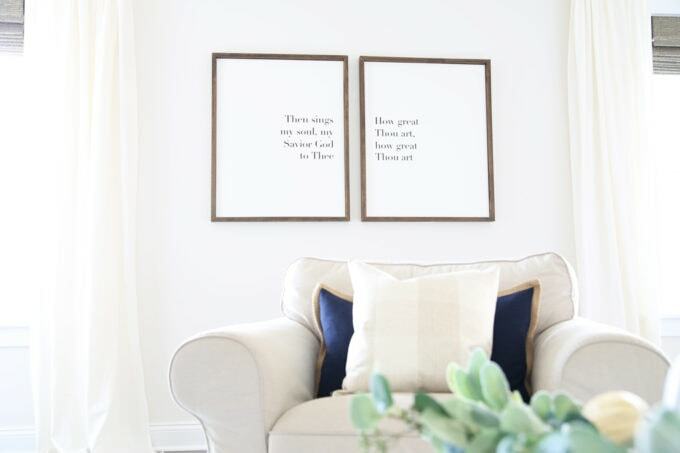 Do you prefer to buy the art for your home or do you DIY it? And if you have any tips on filling big walls, I’d love to hear them in the comments below! The frames are beautiful! I can imagine they are about to become addicting to create 🙂 Thanks for sharing about the cutting & canvas, I never knew you could make something for canvas. Love this Abby! It looks so good and perfect for that space. And they look like something you could buy at Hobby Lobby and prob spend a ton more money on. Awesome DIY idea. Aw, thanks so much, sweet friend! I am loving them! 🙂 Hope you’re having a great week! These are great. I’ve been trying to come up with something to do above our bed for months now. I think I’ll have to try something along these lines. Thank you so much, Crystal! Wall art can be so hard! Best of luck with your project! I love it! They turned out amazing! I have been a little addicted to making signs for my home lately too! I LOVE the hymn you chose! Lovely. 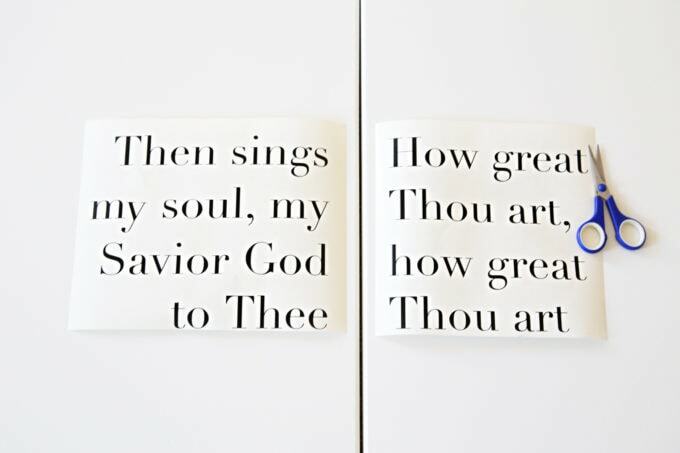 “How Great Thou Art” is my favorite hymn. I like this idea. I think this canvas covers the wall space better and it’s something more personal. Thanks so much, Carrie! I’m liking them, too! 🙂 Hope you’re having a great Monday! Since I’m new to Cameo projects I’m wondering: Should I be cutting all the way through the vinyl backing. It makes it especially difficult to peel the vinyl from the mat and of course my mat is very sticky since it’s so new. It doesn’t seem like it should be cutting through the vinyl backing but I can’t find an answer to this question anywhere. I was sure YOU would know the answer! Also, what’s your favorite brand of vinyl. I’m about out of the Oracle that came in the bundle. I’ve also purchased a roll from Hobby Lobby that doesn’t seem to work very well. Thank you so much for your sweet words, Stacy! It should not cut through the vinyl backing. I usually have the blade set at 1 when I cut vinyl, so that it will cut the vinyl itself but leave the backing in tact so that it is easier to peel away. If you stick the mat to your jeans and pull it away a few times, it “breaks it in” a little bit and gets rid of the overly sticky-ness. 🙂 I mostly order Oracle vinyl from Amazon these days and find it works really well! I hope this helps! Thanks for your reply! I’m using the auto blade set at 1 and it’s still cutting through the vinyl. Any suggestions? 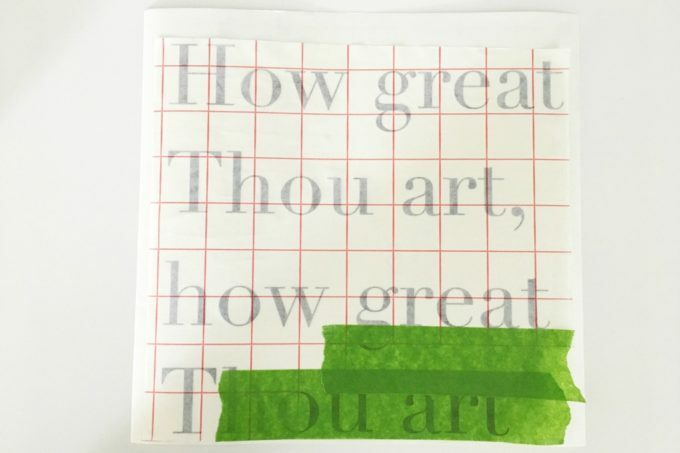 Hmmm… have you tried using a cutting mat under the vinyl? If that doesn’t work, I’m not really sure because I don’t know that I’ve ever had that problem! My go to girl for all things Silhouette is Melissa from Silhouette School (http://www.silhouetteschoolblog.com/), so she may have some answers on her site! I hope you have a wonderful holiday!